Place the garlic, ginger, tofu, dashi, onion, pork, salt and pepper in a medium bowl and mix to combine. Place 2 teaspoons of the mixture in the centre of a gow gee wrapper. Brush the wrapper edges with water, fold over and pinch the edges together to seal. Repeat with the remaining mixture and wrappers. Place the water and cornflour in a small bowl and whisk to combine. Heat half the oil in a large non-stick frying pan over medium heat. Add half the dumplings, flat-side down, and cook for 2 minutes. Pour over half the cornflour mixture, cover with a tight-fitting lid and cook for a further 3 minutes. Uncover and cook for 3–4 minutes or until the water has evaporated, leaving a golden lattice. Turn out dumplings onto a plate and repeat with the remaining oil, dumplings and cornflour mixture. While the dumplings are cooking, make the agadashi sauce. Place the mirin, soy sauce, dashi and water in a small saucepan over high heat and bring to the boil. 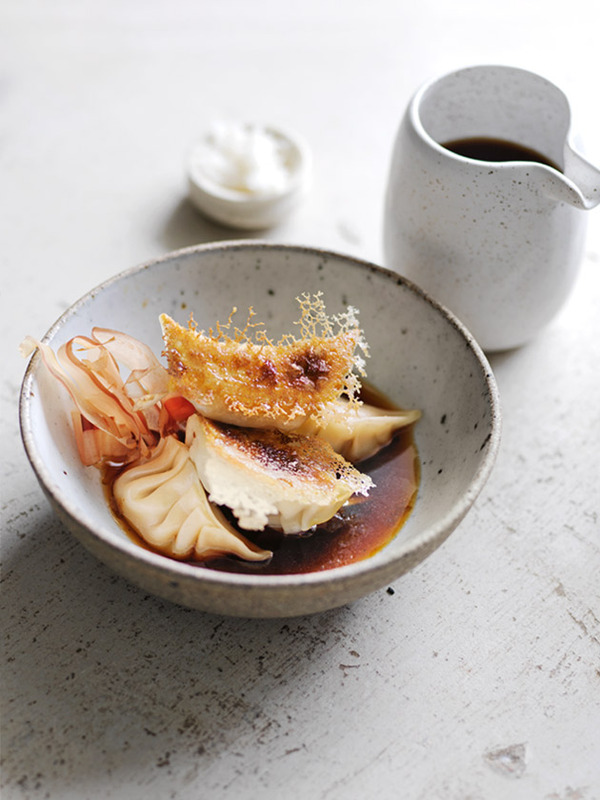 Serve the dumplings with the warm agadashi sauce, bonito flakes and grated daikon. Serves 6. + Dashi powder is a soup stock base and bonito flakes (also known as katsuobushi) are Japanese dried fish flakes. Both are available from Asian supermarkets and Asian grocers.